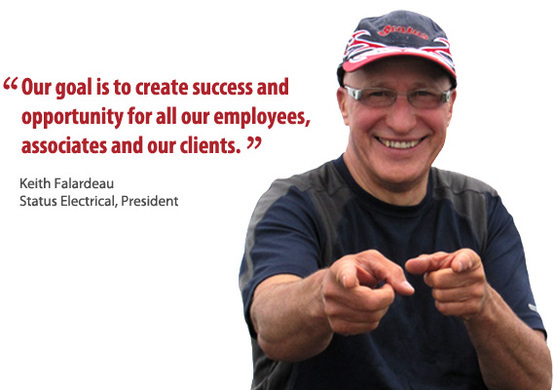 Providing excellence in electrical systems, automation & service for over 35 years. Services: Construction of the Vancouver Aquarium's Discovery Education Centre, now renamed Aquaquest. Services: Emergency generator and distribution. Services: This project utilizes all LED lighting and implements both solar panels and a wind turbine to help reduce power consumption. Located in Abbotsford, British Columbia Canada, Status Electrical Corporation (Status) is a leader in the electrical industry with over 35 years of experience. We employ hundreds of skilled and dedicated individuals with areas of expertise including: industrial, institutional and commercial electrical, instrumentation and controls contracting, and project management. Team Status utilizes strong management and supervisory structure to ensure each and every project is completed safely, on schedule, in a most efficient, cost effective manner, with attention to detail and conformance to the project specification. "Status has been one of the best contractors that I have ever done business with in the last thirty years and I make no bones about telling the world." In today's construction environment, clients need to know they have trade contractors they can depend on to do the job right, on time, and on budget. Our Electrical Division has developed a reputation over the past 35 years for doing just that. Our Automation division has experienced technical and management personnel to undertake any industrial or institutional system integration, security electronics or control and automation project. We are a diversified, integrated systems contractor that provides innovative solutions to our customers. We offer excellence in service and support for our customers' installations and systems. Looking for a great career at a great company? Then consider joining the Status team. Status Electrical Corporation is looking for exceptional individuals to join our Status Systems Division. The Systems Division is seeking qualified Technicians. Status Electrical Corporation is seeking an Estimator for our Low Voltage Systems Department. It's more than just a catchphrase! From our Field Operations and our Head Office Support staff to our Health and Safety program, we truly do Take Pride in Excellence. Our reputation is built on this commitment, and excellence will continue to be the driving force behind our approach to any work we undertake. It is because of this reputation that we are invited to work on projects throughout North America, and it is our commitment to excellence that has helped us win a wide range of awards on many of the projects we have been involved with. This project is the first aquarium in North America to achieve LEED Gold certification and one of the first certified completed projects in BC. Status is very proud of the achievements of its crew on this project. Among the various projects the Status team has completed at LGH are the Jim Pattison Emergency Department and Dishwasher Renovation, and the Ultrasound Chiller Upgrade. Within a space of three weeks we scaled up our crew of Journeymen and Apprentice Electricians who worked around the clock. The renovation itself involved a complete interior make-over including everything from fire alarms to lighting. Status provided all the electrical services on this project to transform the Clearbrook Save-On-Foods into a PriceSmart store. Status Electrical is proud to have provided the electrical work on this project. Status Electrical completed all electrical work necessary for the conversion of a warehouse into a two floor self-storage facility, residential and office space. Status Electrical Corporation is a member of the Independent Contractors and Business Association of British Columbia.